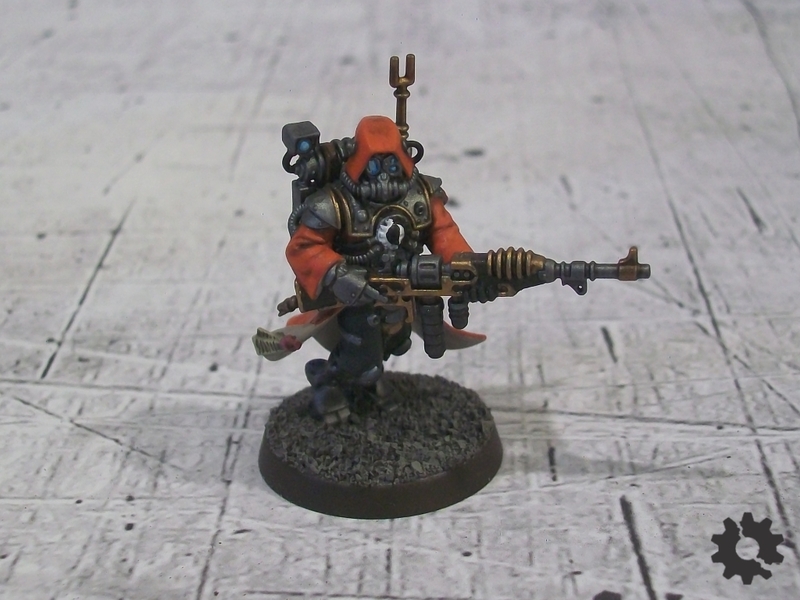 As I mentioned back in my post about the Sons of Entropy, after Shadow War: Armageddon came out and I discovered that I’d need more than cultists to run a Chaos kill-team, I switched gears and started building Skitarii. I think I made a bit of a mistake in planning, though – I had reasoned that since I needed so few of them, I might as well put extra time and effort into painting them. Unfortunately, while I managed to finish all six that would feature in the starting team, during an SWA campaign I’d almost certainly need to add a few more, and trying to push myself painting these guys just left me feeling burned out. While I’m quite happy with the end result, I’m not sure I’ll actually end up using them in a campaign as I originally intended. 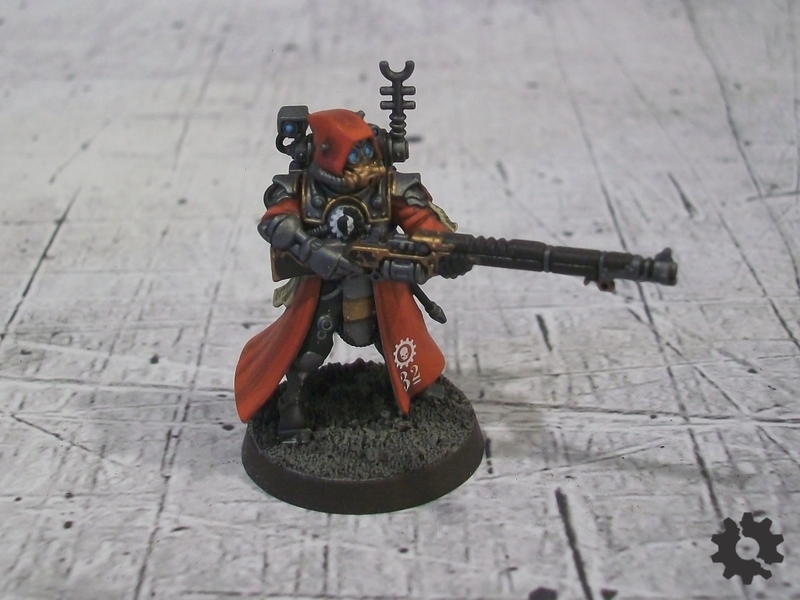 The Skitarii miniatures look really cool, but they’re a bit odd by the standards of GW’s other (perhaps older) multipart kits that I’m used to. Each part is much more specific to each figure and the set is less flexible and posable overall. That may be a necessity given their appearance, with specific legs to go with specific torsos because of their cloaks, etc but it caught me out a bit as I dove in without paying as much attention to the directions as I should have, and then had problems down the line getting parts to match up and align properly. Ranger Cherno_84. His primary directive is to safeguard his Transuranic Arquebus – the weapon is considerably more valuable than its wielder. 3_Var, a Fresh-Forged yet to be tested in combat. His Radium Carbine will ensure that he proves himself suitable or will be destroyed in the attempt. With the blessings of the Glorious Machine, the only logical outcome is the annihilation of our enemies! 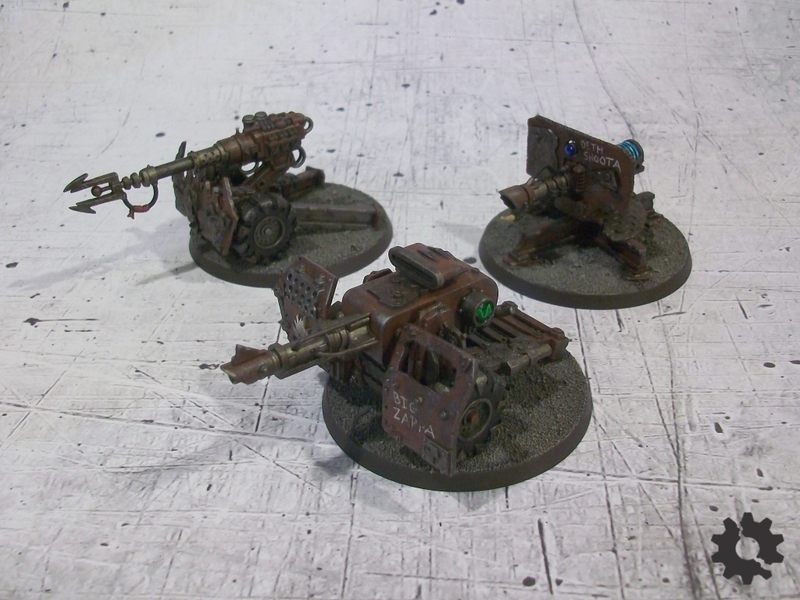 I’m not even sure if Big Gunz are still a thing in current 40k, or if they’ve been replaced entirely by the much larger (and far newer) Mek Gunz. 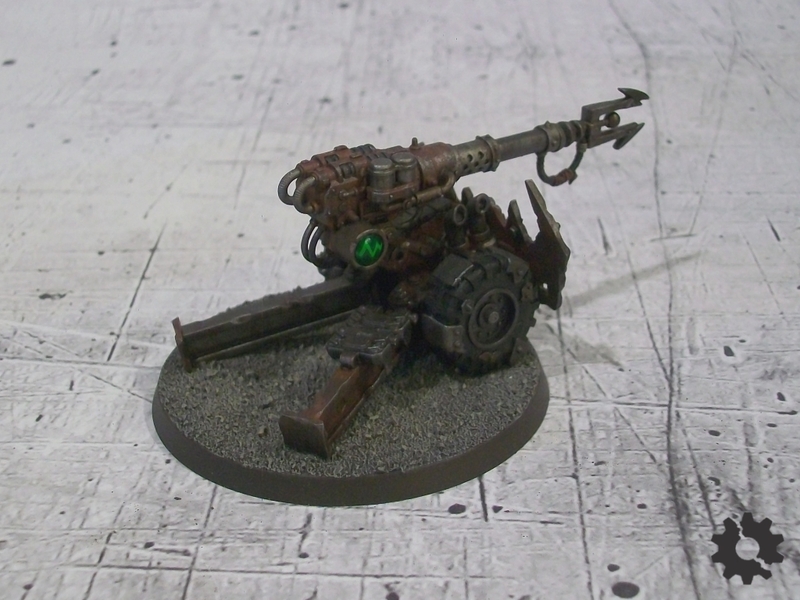 While there’s nothing wrong with the Mek Gunz kit (aside from the price), I’m a little disappointed that it doesn’t include classics like the good old Zzap Gun. 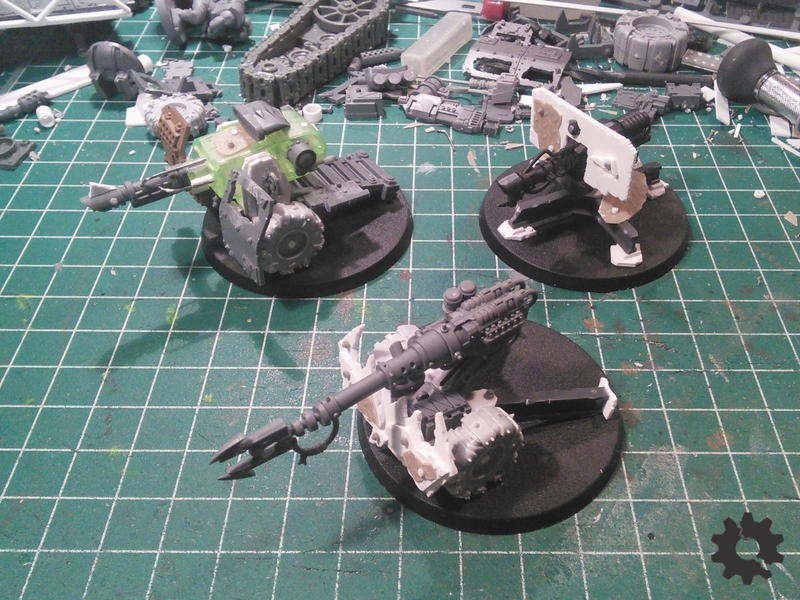 Considering that I play 4th Edition, I found myself a bit caught between the truly ancient Big Gunz models and the too-large and too-pricy Mek Gunz. 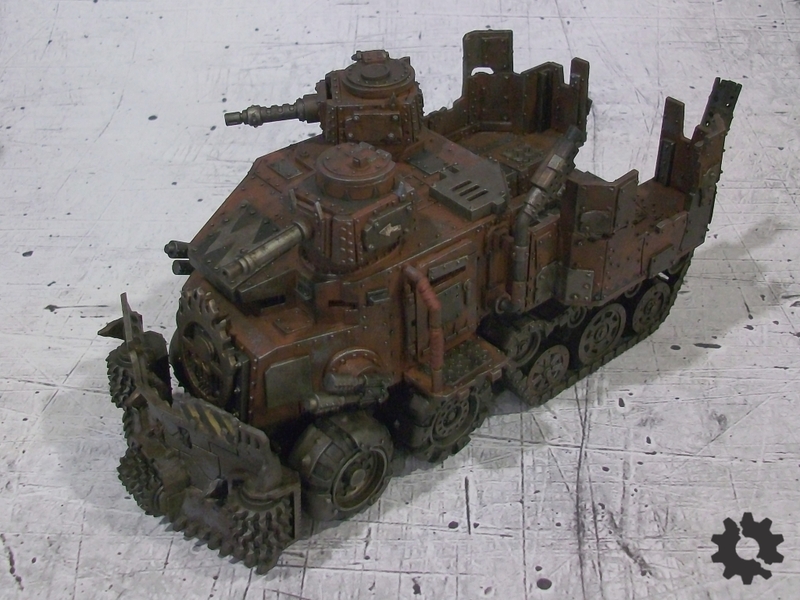 Easy answer: GET ORKY AND BUILD SOME! Let’s get zzapping! The first one I made up – the body of the gun is the remains of a broken LED finger light. I started from there and built outwards. The carriage is mostly plasticard, followed by plenty of bitz. 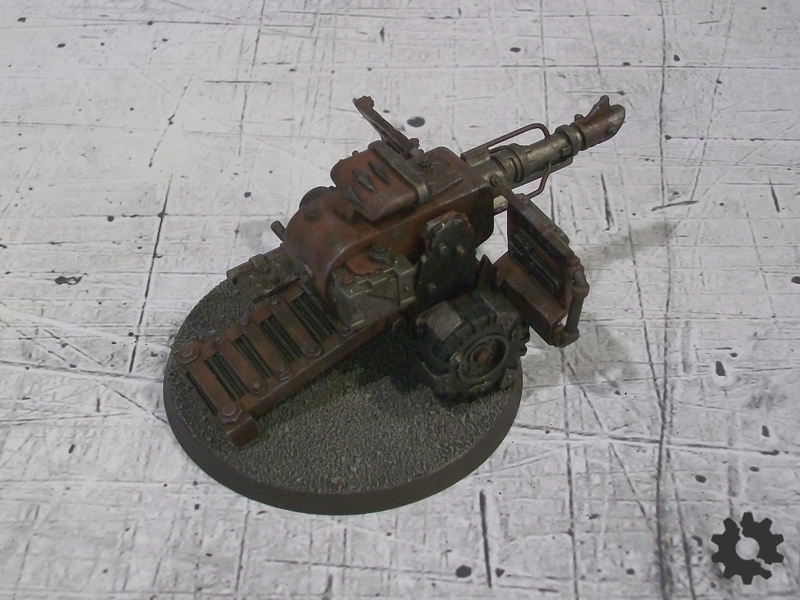 I liked the idea of a split trail, classic anti-tank gun style. 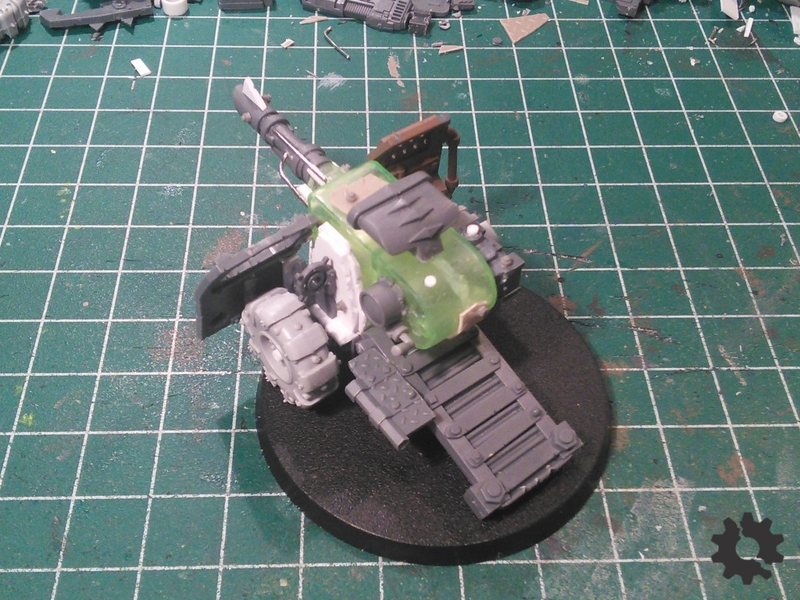 The gun itself is from the Rockgrinder kit (more mileage out of that one!) 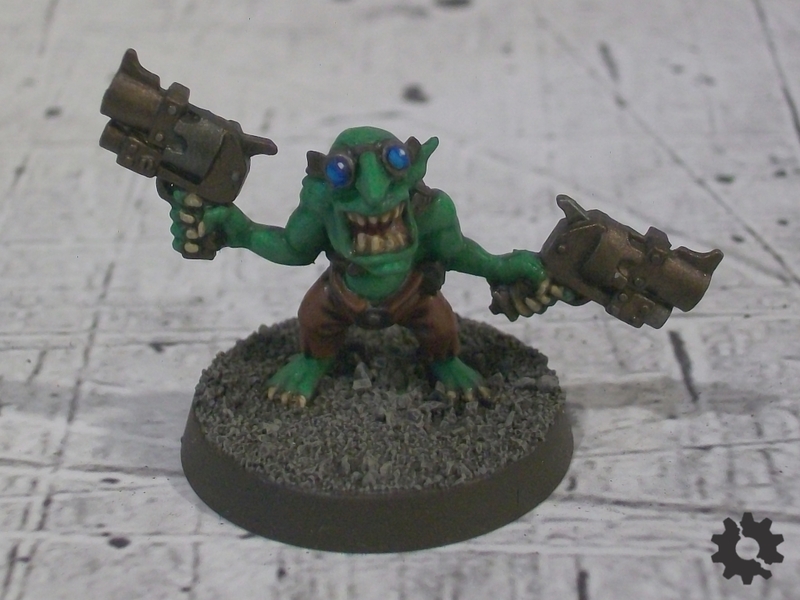 with a barrel from a Dakkajet supa-shoota and a grot-prod tip on the end for the zzappy bit. 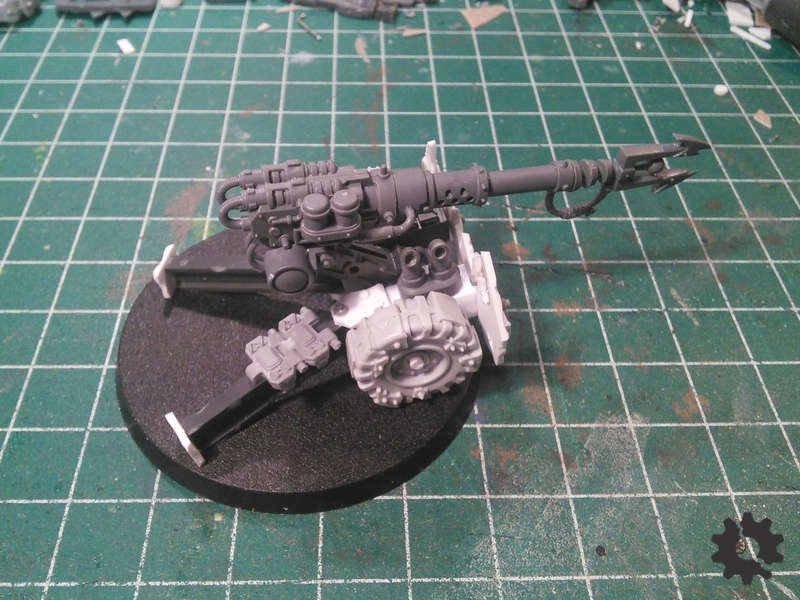 The whole thing is actually held together by the wheel axle, which runs all the way through the gun, the sides (square styrene tube) and into the wheels. Bit more straightforward on the last one. 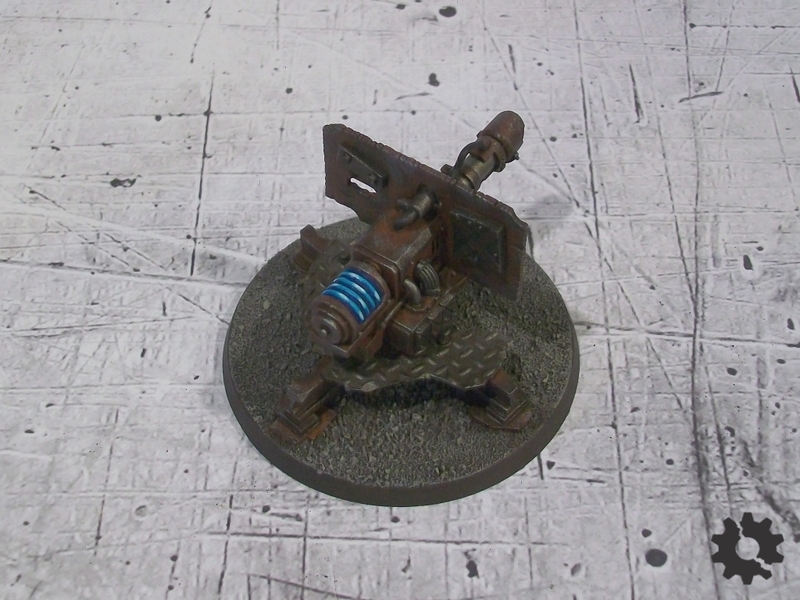 A battlewagon zzap gun, with a gun shield added and mounted on a cruciform base made of plastic I-beams. Extra bits to taste. Suitably grunged-up with sponge chipping and washes. I tried to make the coil at the back look like it’s all glowy and pulsing. It… sort of worked. Good enough! I really liked the idea of little oscilloscope-looking screens on the side. I can’t imagine the grots manning the thing have any idea what it means, though. Just pull the lever, stupid. The greatest enjoyment in miniature gaming for me is visual. 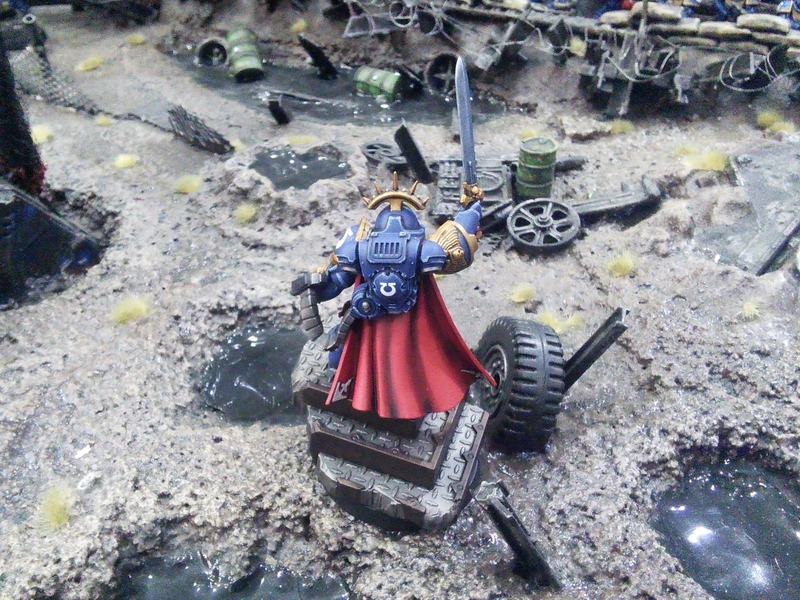 Other types of games can match the scale or strategy or worldbuilding you’ll find in miniatures games, but no board game matches the spectacle of two lovingly-painted armies of figures battling over well-crafted terrain. No RTS video game will give you the feelings of accomplishment and ownership that an army of models you carefully crafted and painted yourself can. So why, so often, do we see tables of half-painted miniatures, riots of mismatched color schemes, and grey hordes of plastic marching drearily to war? Well, because it’s hard. Miniatures games require an investment of time outside of actually playing that’s unprecedented with essentially every other comparable type of game (and typically an unprecedented financial investment, too). When what you really want to do is start playing a cool game, skipping over that visual awesomeness seems like the price to pay in order to start enjoying yourself before the sun burns out. But it doesn’t have to be that way! 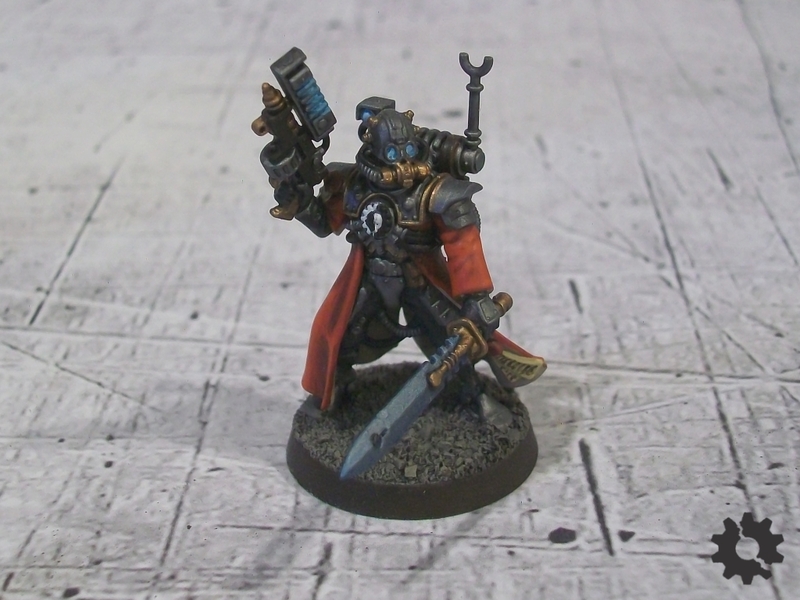 Since starting to play 40k again, I’ve thought a bit about the advice I’d give to friends who might like to join in but would be apprehensive about the commitment of time and effort seemingly required to play with a painted army. It occurred to me that the ideas I had might be useful to a wider audience, so consider this my manifesto for actually getting to play with a complete, great-looking army. Before the Reaper comes to claim your ancient, paint-splattered soul. First, pick up a couple basic troop models for your chosen army and work out your color scheme before getting started on anything else. Having a scheme that keeps changing as you paint different units leads to wasted effort and an incoherent mess on the tabletop. Experiment all you want beforehand, but once you start painting the army proper you should have a plan you can stick to. You also want to have an idea of how large the project will be. 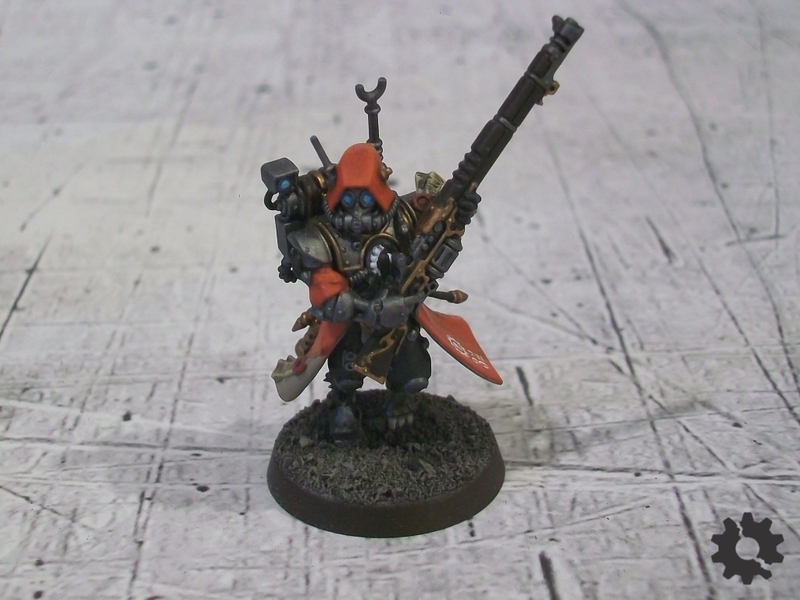 It doesn’t need to be a complete army list, just a list of units and an approximate number of models. This is important in order to know how much effort and detail you should be putting into each figure. Keep track of your milestones – even just having a list of units that you can cross off is a handy reminder of the progress you’re making. I still have the list I made when I was painting my first 40k army as a teenager, with every item crossed off. 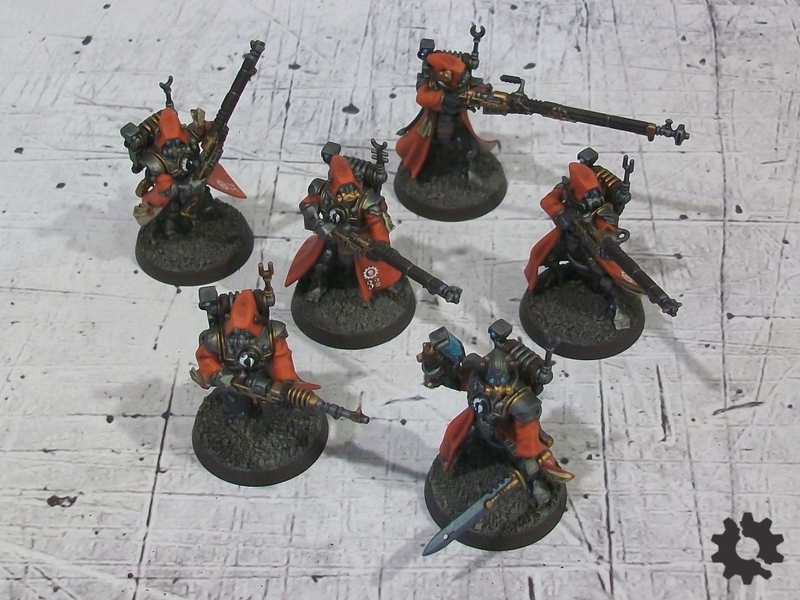 Even long after selling the army itself, I’m still proud of that list. It is way, way too easy to get distracted by a shiny new release or cool unrelated model and find yourself derailed from your primary project. 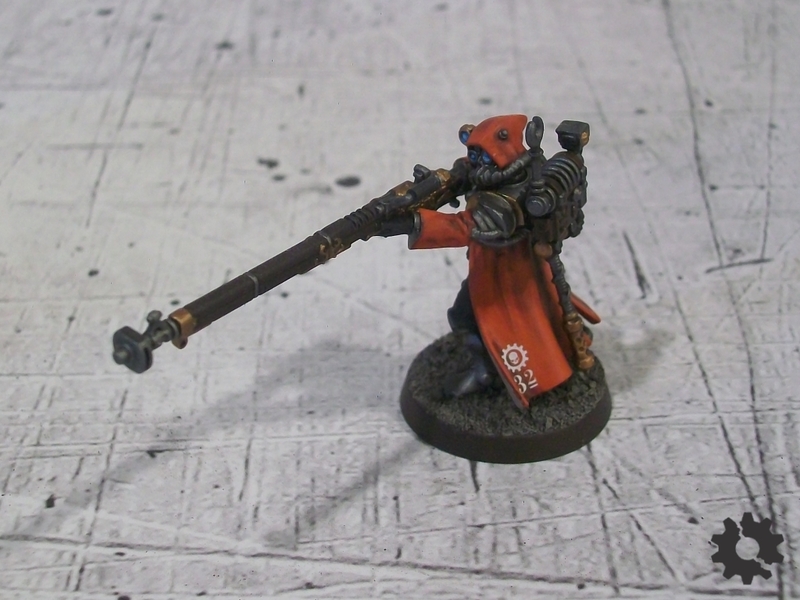 Taking the occasional break to paint something else can be a good thing, but ideally you’ve planned out the scope of your project small enough that you shouldn’t need too many breaks in order to keep yourself enjoying painting. In the case of a larger project, try breaking it down into smaller (but large enough to be playable) chunks that you can focus on and complete, then work on something else as a palate cleanser before coming back to your main army. The availability of color spray paints with matching brush-on paint colors is a godsend. In a single step, your figures already have a lot of their color blocked in and ready to have detail added. While this does significantly reduce your choice of color compared to the vast variety of non-spray colors, the trade-off is absolutely worth it for actually having a completely finished collection that much easier. The matching paint pot color part is important, too – without it, any mistake with another color later means that your timesaver has now become a painful liability since it will be much more difficult to fix. This isn’t really much of a restriction anyway, since Army Painter and Games Workshop are the go-to source for miniatures spray paints and both have a matching paint pot for every spray they sell. 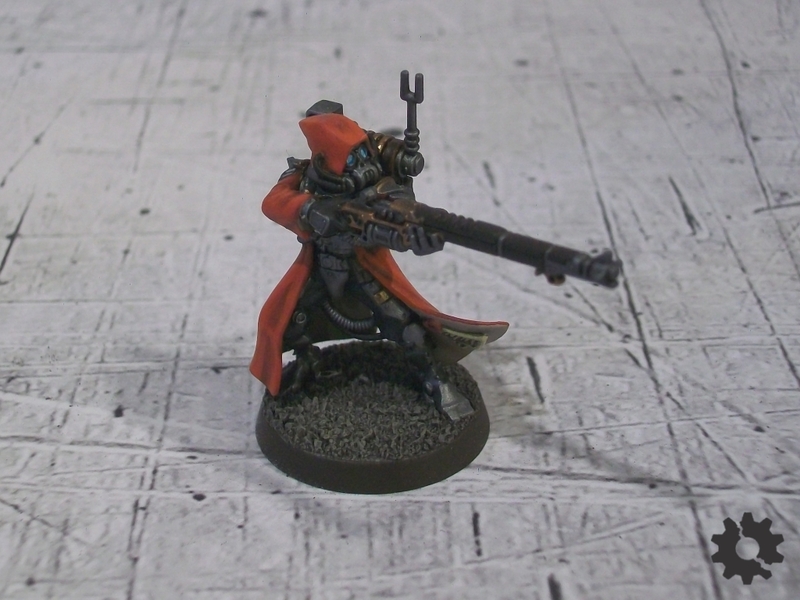 Since you’ll usually be painting this color over a large portion of a miniature (think fatigues, carapaces or sections of armor) you want to choose one that will cover over your chosen main color with a minimum of fuss. This usually means a darker color – this is something you should test in particular when picking your color scheme. 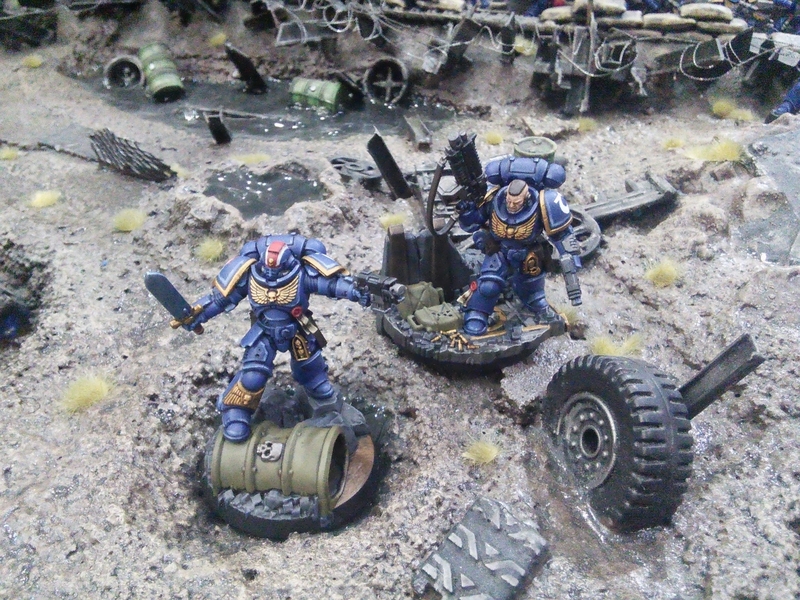 The Citadel base paints in particular usually have quite good coverage and are a good place to pick out your secondary color. 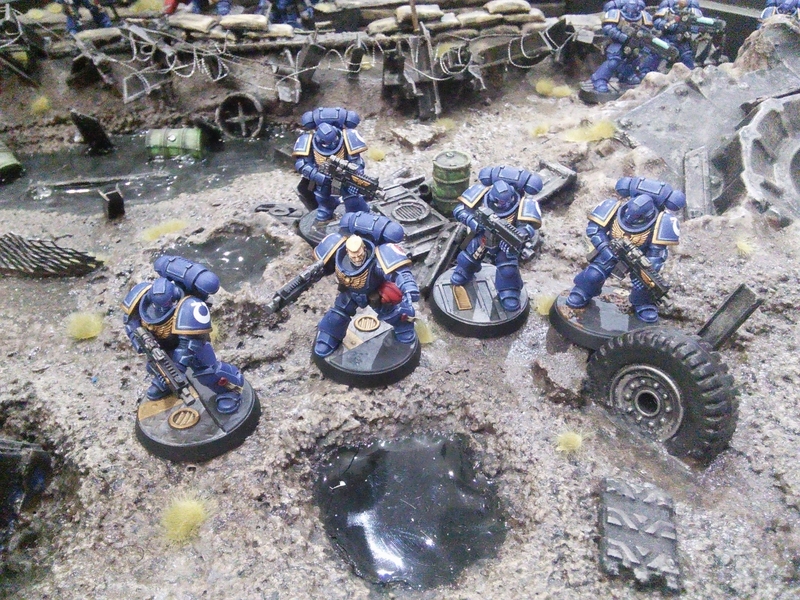 While highlighting is usually done later in the painting process, techniques like drybrushing tend to make a mess of adjacent areas. 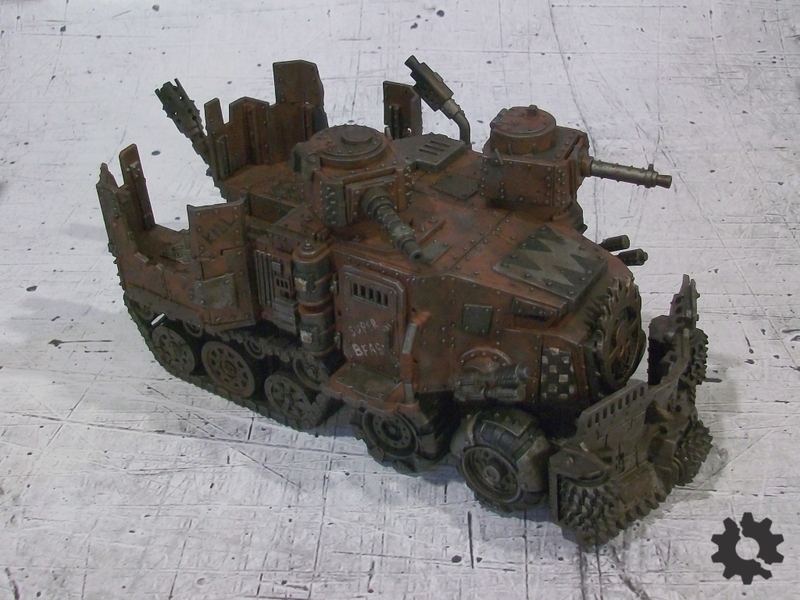 It’s worth planning around this and getting techniques like this done before you put any effort into painting other areas nearby. Similarly, difficult spots that you’re more likely to make mistakes on are best finished before nearby colors that you’d have to touch up. The flipside is true, too – if you’re going to be painting over the adjacent parts later anyway, why waste time being more careful that you need to? Grab a bigger brush and get it done. This may seem like an obvious thing but it’s a mistake I find myself making all too often. I’m focused on painting the miniature itself and I don’t think of the base until after I’m done. Unfortunately, most basing techniques use drybrushing to bring out texture and detail, and it becomes almost impossible to finish the base without having to go back and repaint the figure’s feet. Find a basing style that only requires you to glue layers of material on, or get the trouble of texturing and drybrushing bases out of the way before touching up becomes much more complicated. One of the biggest risks with trying to paint an army quickly is that things end up looking flat and boring. But it doesn’t take exhaustive effort on every little thing in order to avoid this. Spending a few extra minutes to make a feature or two on each miniature stand out draws the eye and elevates the whole miniature without taking a lot of time to do. Bits like lenses and gems are some of my favorite targets for this approach, and decals offer a lot of added detail compared to the time it would take to add it anyway. A Space Marine with the shoulder insignia decals looks way more complete and detailed than just a blank, boring shoulder pad. Duh. Premixed washes are available in a wide variety of colors from basically every paint supplier. They give an improvement to your miniature’s appearance all out of proportion to the time and effort they take to apply. I can’t think of any other technique or product that gives you the bang-for-your-buck that they offer. 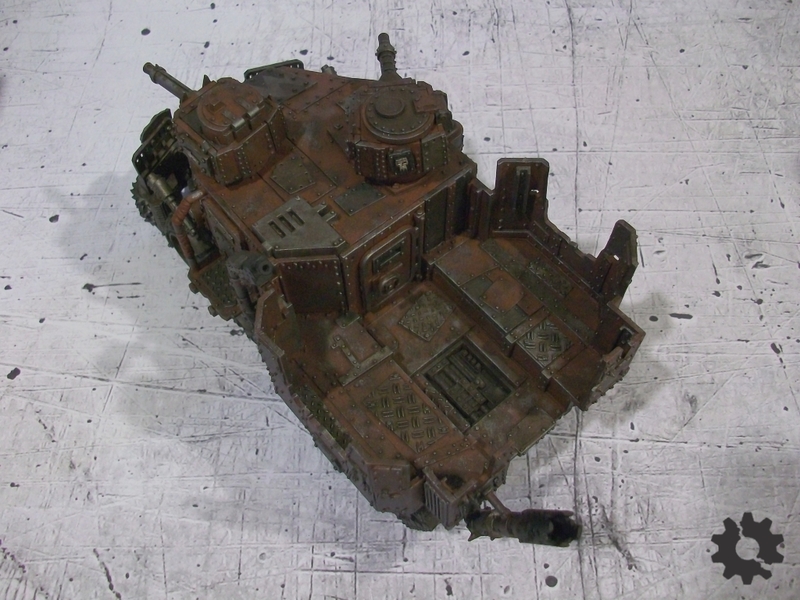 Bright or eye-catching parts of your models can benefit from applying a specific colored wash, but most smaller details or darker areas only need a simple black or dark brown wash to look just fine. Even painting tutorial videos produced by a large corporation and (ostensibly) aimed at beginners seem to expect layers of highlight on pretty much every part of a miniature. I’m here to tell you that contrary to what they (and the rest of the internet) might tell you, this just isn’t necessary to have an attractive, complete army. Choose one or two large or focal-point areas and concentrate your highlighting efforts there. Most other areas and especially smaller details like straps, claws or pouches will look just fine after hitting them with a wash. If you really want to, you can always go back and add more highlights after the project is done and you’re already having fun playing games. Extra detail added to your rank-and-file goons has to be multiplied over every single one of them, but taking the time to add that detail to a handful of heroic or otherwise important miniatures takes much less time and will be much more noticeable to anyone looking at your army. 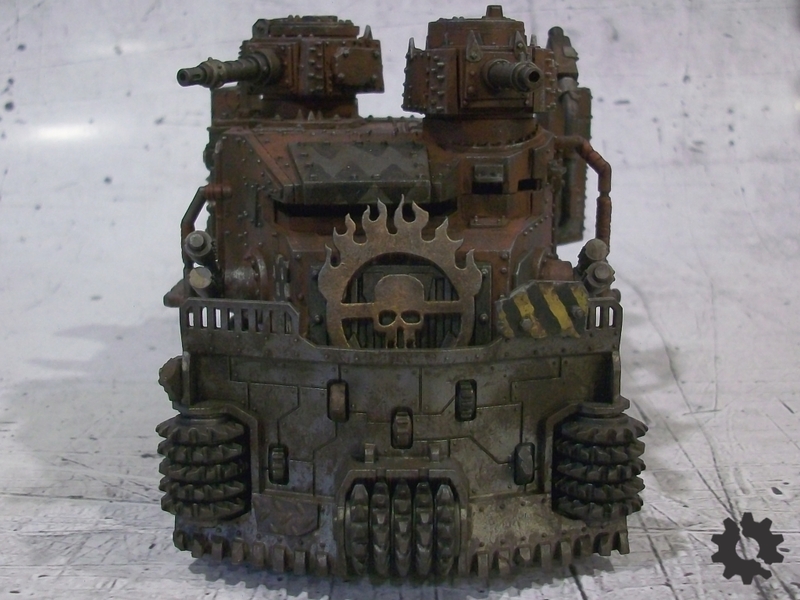 Put an extra highlight on all your Warboss’s tiny pouches or freehand a cool crest on your Space Marine commander. Such models are really the crown jewels of your army and will be the first thing that most people will look at and remember. This certainly isn’t the only way to go about actually painting and finishing your projects, but it’s the advice I’d give to someone who wanted to join me and my friends in playing and enjoying games like 40k (and also advice I could stand to remember myself from time to time). 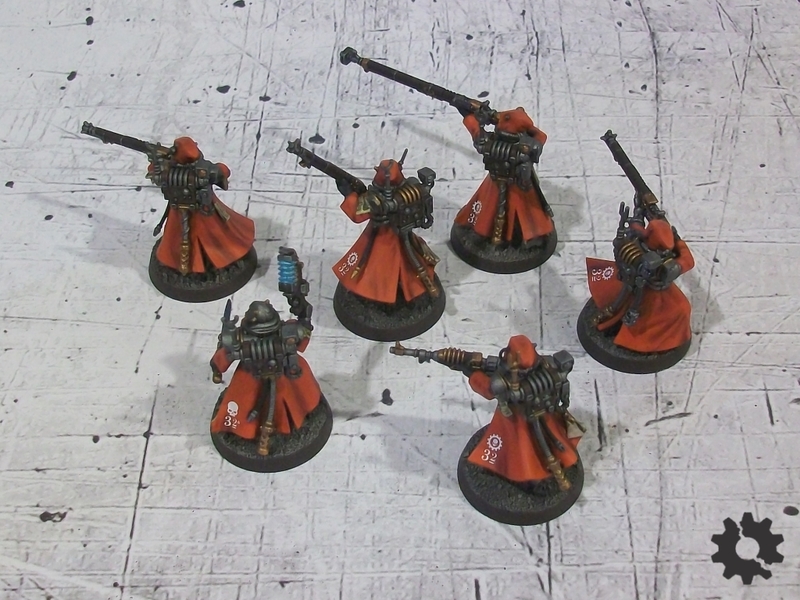 If it gets just one more army out of the depths of plastic-grey despair and on to the table in glorious color, I figure it’s worth posting about. Thanks for reading, and happy painting! Nothing quite like driving over your enemies in a saw-tipped metal monstrosity named after a Rob Zombie song. The business end, also featuring an insignia I particularly favor (WITNESS!). I laser-cut it out of fiberboard. I’d like to feature it in more parts of the army, but this is about the smallest that the laser I have access to can accurately cut. I’ve designed a version for casting to fix this problem, but I haven’t got around to finishing it yet. In order to be truly finished it needs side gunners with two more big shootas, but I’m calling it good enough to use in games for now. 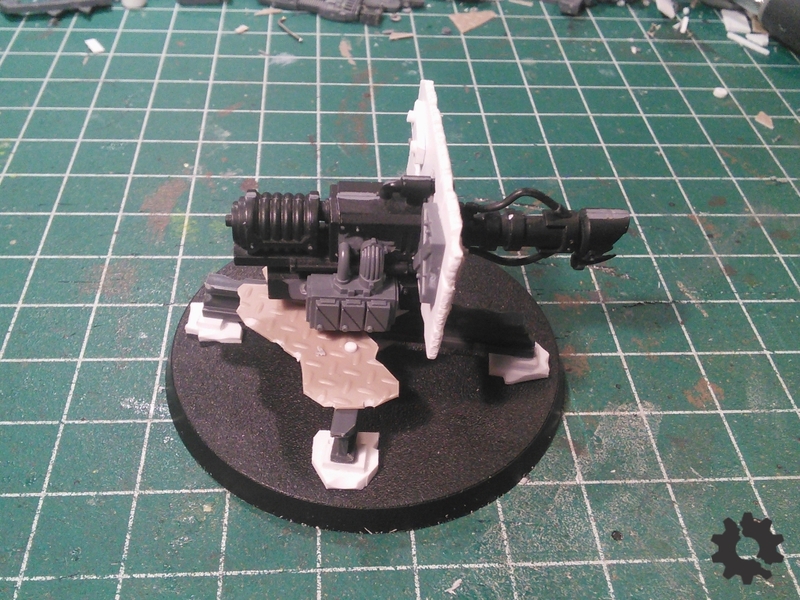 I’ve also magnetized the top turret so I can upgrade it further if desired. But what if your ride breaks down and you need somewhere someone to take cover behind while you bash it back into shape? 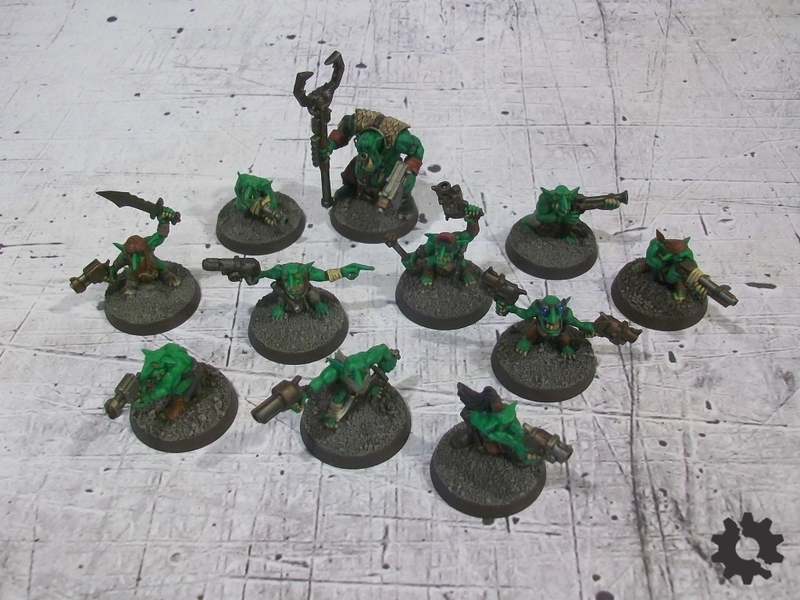 In their three games so far, these grots have had a bit of a mixed bag – ranging from being sucked into the warp while standing in front of a malfunctioning Shokk Attack Gun, to being unceremoniously shot to death by Chaos Space Marines, to the heights of glorious triumph when they managed to gun down a single Necron Warrior (also while standing in front of a malfunctioning Shokk Attack Gun). But when you need bullets caught, there’s none more trustworthy. Wouldn’t you trust this face? 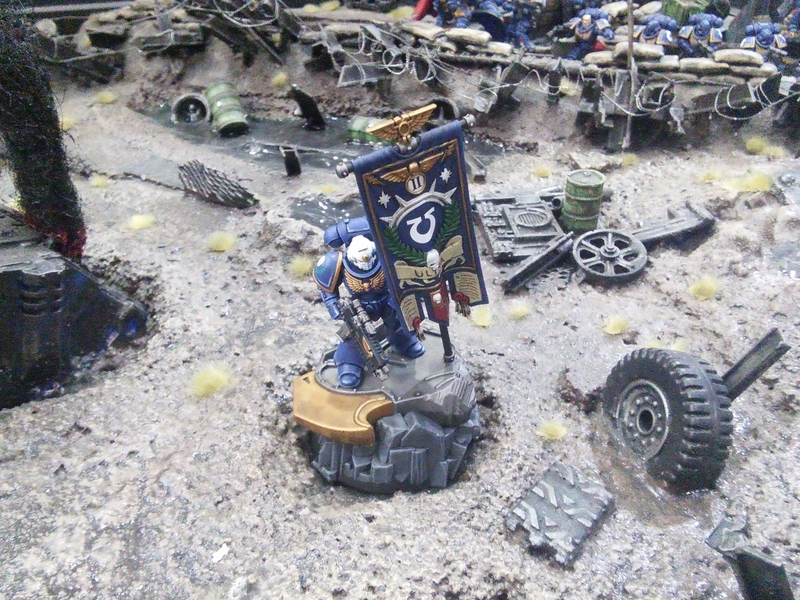 Were I to paint a Space Marine army, it wouldn’t be Primaris, it wouldn’t be done with in a bright-edge-highlighted style, and it wouldn’t be Ultramarines. 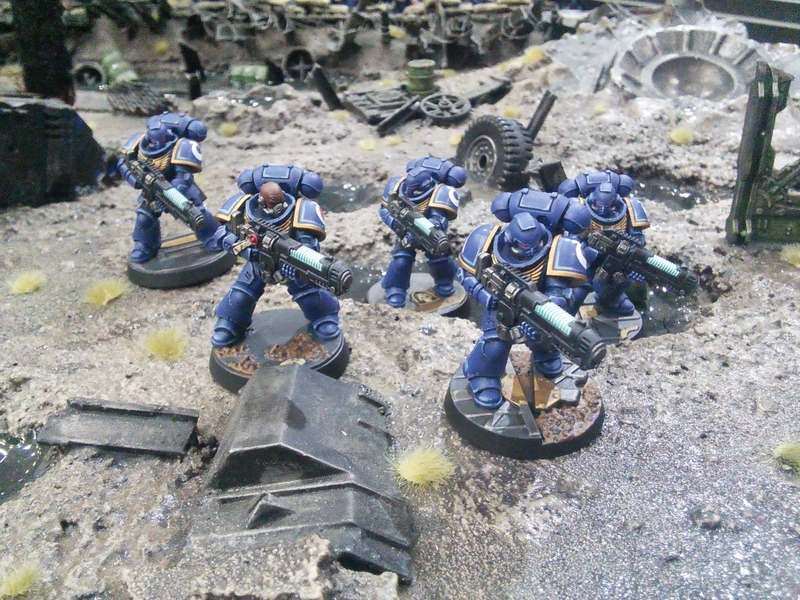 So here’s a Primaris Ultramarines army with bright edge highlights. But none of this project was really up to me – this was a demo piece that I did for the store, right before the launch of 40k 8th Edition and consisting of the Space Marine half of the new Dark Imperium starter box. This wasn’t originally my project, either. 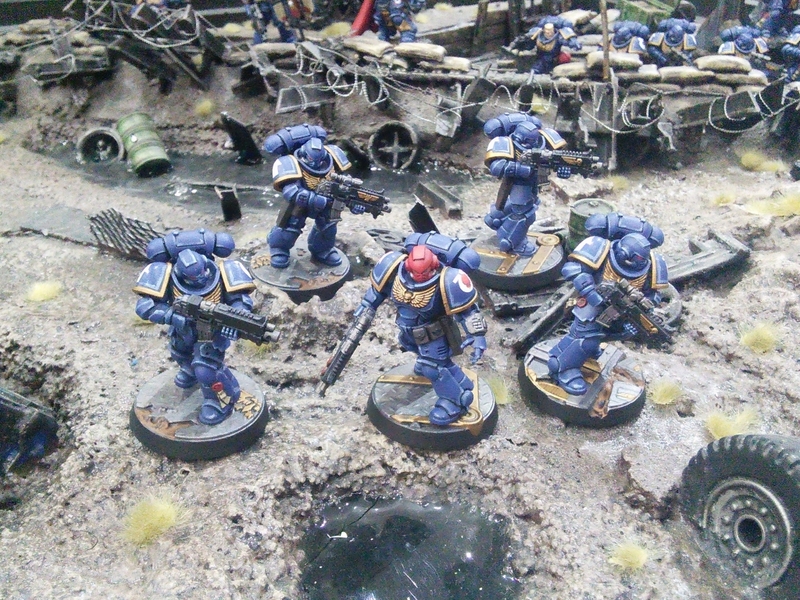 It had started with one of our other staff painters, who was called away by some kind of family matter just after finishing the first unit, the Inceptors (which is why they’re not pictured here – I didn’t paint them!). This meant that the color scheme and style were already set, and I only had about a week before the release to get this finished. Hey, at least I get paid. Truth be told, in hindsight I didn’t mind working on something in a style and palette that I wouldn’t normally use. 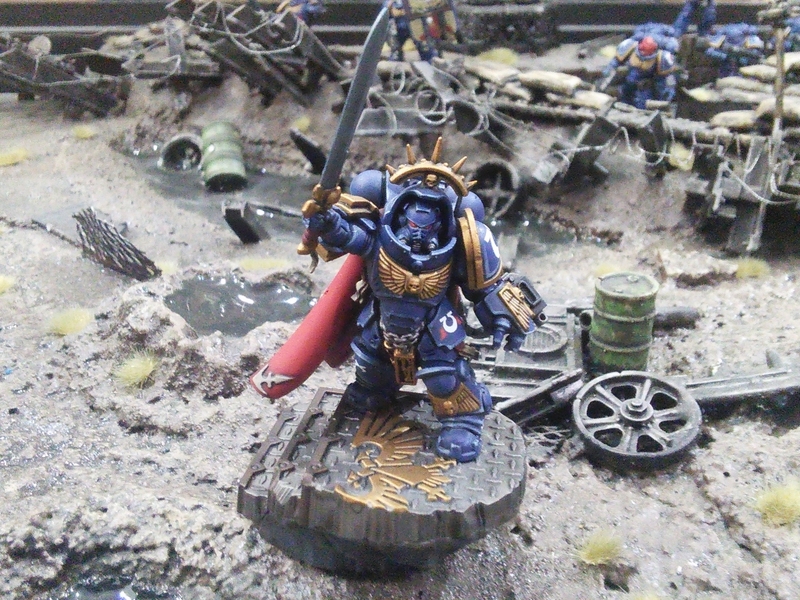 And I don’t really have a problem with Primaris as miniatures – while I think resizing Space Marines after so many years feels like an annoying cashgrab and the background behind them is poorly written, the sculpts themselves are fine. I like the cleaner look to the armor and the more tactical-looking weapons. My only real beef is with the Inceptors – the role they’re meant to play is interesting, but the hover skates and the head-mounted jetpacks really don’t do it for me. I’m afraid these photos are a bit less clear than usual; my apologies. They were taken in the store on our display board and I only had my tablet to take pictures with. Chapter Ancient… how ancient can he be? They only just starting making Primaris guys! All in all I’m fairly happy with the final result, given the tight deadline and lack of choice in the paint scheme.